Starts Thursday, May 25th at 12:00 AM ET to Monday, May 29th at 11:59 PM ET. Open to US, 18+ years of age. Enter the giveaway by heading to the #MagicMemorialDay Giveaway page and submit your email address on the form on the page. An additional entry can be earned by liking Magic Style Shop on Facebook after submitting your email. The winners will be chosen through a lottery drawing and notified on Wednesday (5/31) via the email address used to enter. Also check out Macy’s Memorial Day Sale Here! Disclaimer: Work Money Fun is not responsible for prize fulfillment. 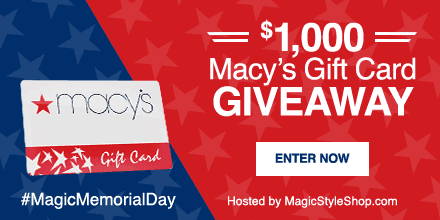 Sponsor is responsible for awarding prizes to winners of Macy’s Memorial Day contest.